We all dream of a burgeoning vegetable patch with rows of lovely, pristine leafy greens, but the reality of reaching this vegetable growing equilibrium is not that simple. The pre-planning, rotating, soil warming, successional sowings and the constant care and maintenance to nurture and ward off pests and diseases does take up lots …and lots…of time. I admit, hold my hands up, I do find it difficult to grow veg in my own garden. The best I can do is herbs and salads in pots and troughs; and potatoes in bags. My excuse? A north-facing plot on snail infested, moisture retentive clay soil is not the ideal start. Put together with a young family; running a business; and the daily routine of domestic chores simply means I find it hard to make time to do veg justice…despite the dreaming of wanting to! Reality tells me that I need something which is tougher, needs less nurturing but can still produce a tasty, and beautiful, crop… enter humble fruit. Fruit is by far easier to grow and look after than most vegetables. Fruits generally come in a number of fuss-free forms such as perennials, canes, shrubs and of course trees. Buying them will cost more than a packet of seeds, but they are an investment as they will last and continue to produce for many years. Simply planting them in the soil, preferably is a sunny spot, will [in most cases] ensure their growth, regardless of how they’re treated [within reason of course]. In fact, [I’m putting my neck on the line here] growing fruit is easier than maintaining a lawn. The ‘easy peasy-ist’ of the fruits has to be strawberries. To start get hold of some decent specimens from your local garden centre/nursery and plant either in containers [if you don’t mind watering] or directly into your borders. 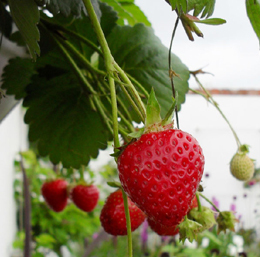 By summer you will have some delicious strawberries that are far tastier than shop-bought ones. Strawberries are notorious for sending out ‘runners’ [little stems that root into the soil and produce a new plant] which is certainly handy for expanding stocks. If you have enough though, simply snip them off as soon as they appear. The only other maintenance would be to cut back old foliage in the spring and give a good feed [which all plants will love you for]. Next on the easy list is rhubarb. Although you do need a bit of patience with this one as new [and usually small] rhubarb plants need to be left for the first couple of years to bulk up before harvesting. They also love drenches of liquid feed throughout the summer. Raspberries. These are one of my favourites and are just as easy to grow. I especially like them as they will tolerate the more shady spots in your garden. There is a rule of thumb with raspberries as there are two types, summer-fruiting and autumn-fruiting. The summer-fruiting bears raspberries on growth done the previous year, which means you cut out just the fruited canes in the autumn and leave all the new ones in place. The autumn-fruiting is simpler, cut all canes back to the ground after harvesting as these will fruit on one season’s growth. Blackberries, tayberries and logan berries are also very easy to grow. 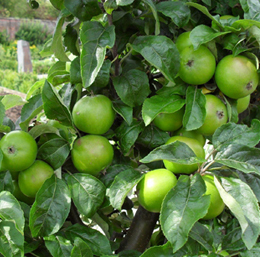 If you prefer to have a go at growing fruit trees, choosing which types to grow is probably the most difficult task as there are hundreds of varieties available. Go for your favourite fruit first, then look into the different qualities of the varieties [www.orangepippin.com has good descriptions of apple varieties]. The more exotic fruits like peaches and apricots will need more care especially protection from early frosts but apples, pears and plums will generally do very well. Then there is the rootstock, which simply determines the overall size of the fruit tree. A specialist fruit nursery will be more than happy to help you choose the best one for the space you have …and if space is really minimal opt for a trained form like a fan or cordon. These are usually more expensive than young trees [between £30 and £60] but will start producing fruit earlier as they are older specimens. One last point to bear in mind is that some fruits need pollinating partners to set fruit properly; again something which a specialist nursery can help you with. 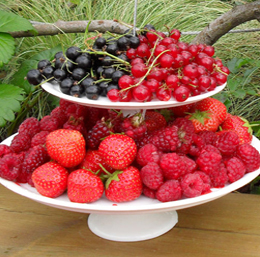 Growing fruit is greatly rewarding, its overwhelming yields and minimal maintenance make it very appealing. It is these qualities [plus the yummy puddings they can make] which have certainly won me over and is why I love to promote the growing of fruit. So, if free time is a rarity and you would love to get involved in growing your own, fruit is definitely the way to go.